"Life Lessons on the Playing Field" is the theme of the Athletic Program at Ada Christian. We seek to honor God thru physical activity, sport and play throughout the school year. It is our goal in the Athletic Department to not only develop physical abilities and sports skills, but to develop strong Christian character traits in our student athletes. Physical activity is a gift from God and therefore should be treated as such, with thankfulness. As with any gift, student athletes should work to the best of their ability for His honor and glory to develop this gift. Through our athletic programs, we seek to fulfill our mission of "providing all students with multiple opportunities to participate in athletics, pursuing excellence with a distinctly Christian perspective." We believe that athletics provide an opportunity to develop Christian characteristics in a unique setting. We believe that students who elect to participate in athletics are voluntarily committing to participate in a program which requires self-discipline and that they agree to abide by rules and policies of respective programs. 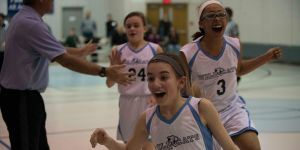 We believe athletes are suing their God-given talents to build their confidence, discipline and work ethic as well as leadership, teamwork, sportsmanship, and respect for others. We believe our coaches will lead by example, believe in the mission of our school and athletics, and strive to make every experience a success. We believe our coaches will teach age appropriate fundamental skills as well as team strategy and game tactics. We believe the school will proide the facilities and structures to be successful. Athletics serve as a great forum for parents to support and encourage their student athlete. 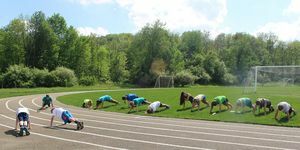 With this in mind, we list the following as specific suggestions for ways you and your student can receive the maximum benefit from participating in athletics. Please refrain from offering instruction from the sidelines. Coaches need the undivided attention of each athlete in order to produce a successful team. Get involved. Volunteer. Ask the coach if they need any assistance. Support your student athlete when they have good days and bad days on the court or field. Foster teamwork. Cheer not only for your son/daughter, but for all of the players on the team. It is our policy at Ada Christian School to address directly the individual that you have a conflict with to try to resolve it and bring restoration to the relationship. This confrontation should take place with love and grace, and should also take place after a 24 hour "cool down" period has occurred. It is important to remember that coaches and students are being trained in this Biblical principle, and to exercise extreme grace in addressing a conflict. If the matter cannot be solved by one on one communication, it should be brought to the attention of the Athletic Director. Consistent bedtimes and healthy eating habits are important for optimum performance in a student athlete's life. God first, Family second, Academics third, Commitment to sport fourth. Sport is a gift from God and participating in athletics is a privilege. Encourage your student athlete to work hard, and do everything for the glory of God. If the school is closed due to bad weather, there will be no athletic meet ins whether it is practice or a game. The school will also be closed during holiday breaks. Practices will only occur if pre-arranged with the Athletic Director. Students in grades 5-8 will have the opportunity to participate in a variety of sports throughout the fall, winter and spring months. Sports available to girls include volleyball, basketball, track and field, soccer, swimming, and softball. Sports available to boys include soccer, basketball, track and field, baseball, and swimming. Athlete sign-ups are very important for planning in each sport season. Athlete sign-ups determine how many coaches are needed and the number of teams turned in to the scheduler. Official sign-ups for winter and spring seasons will take place 4 weeks before the start of each season. Fall sign-ups will take place in the spring, due to the early start time in August before school begins. Please note: There will be NO late sig-ups after the sign-up deadline for each season. Unfortunately, late signups contribute to overcrowding on teams, and game schedules being delivered late. Coinciding with our philosophy of participation, Ada christian has a no-cut policy at the 5th - 8th grade level. GRACEAC allows each school to enter as many teams as they are able to make. This allows for every student athlete to participate in ACS athletics. ACS will make every attempt to keep teams small. In order to do this we will not be allowing late sign-ups to take place after the sign-up deadline. If two teams are formed at a grade level they will consist of two equally talented teams. There will be no A and B team. The teams will be formed by the two coaches and the Athletic Director. Due to the need to create two equal teams preference will not be given so that friends can be on the same team. If special arrangements need to be taken into consideration you may notify the AD before the teams are divided. Every effort will be made to keep each grade playing with their own grade level. However, in some circumstances there may be a need to create a combination team. This will be done at the discretion of the Athletic Director and coaches involved. Coaches are hired by the Athletic Director. ACS staff members have first priority in coaching, but often coaches are needed from outside of the staff. Coaches must be Christian examples to our students and have a thorough knowledge of the sport and the fundamentals of coaching. Coaches are expected to communicate effectively to students and parents regarding practice times, game schedules, and expectations. School issued uniforms will be handed out to all athletes. Please return all uniforms promptly at the end of the season as many uniforms are re-used for another sport later in the year. Uniforms should be clean and in good repair when they are turned in. If you fail to turn in a uniform, you will not receive another sports uniform until the first is turned in.